Cuba release 'could lead to US lifting embargo' | Cuba Headlines – Cuba News, Breaking News, Articles and Daily Information MADRID (AFP) – Cuba's release of all its political prisoners would improve its relations with Europe and United States, and could lead to the lifting of a US embargo, the Spanish foreign minister said on Wednesday. "> MADRID (AFP) – Cuba's release of all its political prisoners would improve its relations with Europe and United States, and could lead to the lifting of a US embargo, the Spanish foreign minister said on Wednesday. MADRID (AFP) – Cuba's release of all its political prisoners would improve its relations with Europe and United States, and could lead to the lifting of a US embargo, the Spanish foreign minister said on Wednesday. Miguel Angel Moratinos welcomed as "good news" Cuban parliament chief Ricardo Alarcon's announcement to AFP on Tuesday that his "government's wish is to free all the people" not accused of murder. The Spanish foreign minister said before parliament that such releases would yield "political consequences" for relations with the European Union and the United States, in particular a possible "lifting of the embargo" that Washington has maintained against Cuba since 1962. In a Spain-brokered deal struck between the Catholic Church and Havana, Cuba agreed this month to free 52 of 75 detainees who had been sentenced in 2003 to prison terms of up to 28 years. Eleven freed prisoners have already emigrated to Spain with their families. A twelfth prisoner arrived on Wednesday and another eight were expected to arrive in Madrid later on Wednesday as part of Cuba's biggest release of political prisoners in over a decade. 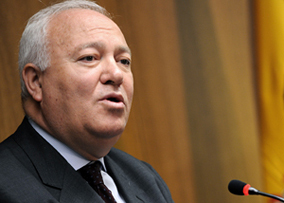 In light of the releases, Moratinos urged the European Union to change its "joint position." He told Spanish lawmakers that there was nothing "coincidental" in the releases and that they were the fruit of a six-year dialogue with the Cuban government. Moratinos said he wanted to replace the EU's "joint position" on Cuba with a "cooperation accord" despite the reluctance of some countries, including Germany and France.